Mixed wood or high-gloss painted cabinets, reclaimed brick or tin-look copper vinyl backsplash, brushed steel or satin hardware, chic loft or rustic farmhouse. The possible elements of a dream Winnipeg kitchen renovation are as varied as the foods created therein. Let's talk about palate. In today's kitchen design world, the opportunities are really endless and there's almost an 'anything goes' mentality. You love colour? You got it. You love neutrals? Sure thing. You want chunky, retro lines? We can do that. You crave something sleek and minimalist? It's yours. What is really going to make your kitchen work though, is you. So if you can nail down just three simple areas of design desires, your kitchen is sure to be a success; a space you will be proud of, and a space that will work for your family environment and lifestyle needs. Hub or supplement. It is crucial to first determine whether or not your kitchen will be the prominent hub in your home, or more of a utilitarian room to supplement your overall space. The first means you want to spend a lot of time in your kitchen, using it as the battle station for the operations of your home. In this circumstance, your gourmet kitchen will dominate your floor plan, and be open to your other living spaces. If you're someone who dreams of hosting game night with the TV visible from your dining space; large group gatherings around the island full of snacks and appies; homey visits, cooking while friends or family chat all around you–then this the space for you. But maybe you see yourself bringing a feast out to your dining space from a galley kitchen to the side. When it comes to dishes, you are more of an 'out of sight, out of mind' kind of person and the layout of your home demands a more subtle, functional space; with flare, but definitely more of a side room, supplementary to your dining space or living room. This choice is a great place to start as it carries over into so many other areas, and even your appliance decisions. If you see yourself cooking as entertainment for guests, you might choose appliances that wow visually, over appliances that simply perform their function. Overall look. Grab some magazines or click around online. You might immediately be grabbed by certain looks, and 'what's in' for kitchen design is so varied right now almost anything goes. Instead of being intimidated, get intentional. If you have a Pinterest account, start a pin board for your kitchen. Go the old-fashioned route and cut out pages from magazines. Check out Houzz and pay attention to online magazines. If you make an effort to collect different pictures of what you like, soon you'll start to see a trend you'll be able to identify and articulate. Is your look more of a rustic warehouse, but with one modern twist, like white veneer cabinets? Is your look more traditional, with wood cabinets and butcher-block countertops, but with a bold and deep farmhouse sink? Do you crave French country, but with beachy-elements thrown in and maybe a surprise choice with stainless steel backsplash? Even if you don't know what you want, there is usually an overarching style theme when you start pulling your loves together. Do you feel like you get this far and your whole vision starts to fall apart? Well, don't worry - there's a reason people go to school for things like this. If you're not quite confident in how to really bring a cohesive look together, an experienced, award winning interior designer can help! Accents and fun. Like spices in the kitchen, here is where you can let your true taste preferences shine. You can highlight any style at all with your very own flare in paint colours and decor! On-trend kitchen colours vary from season to season, but if you want to know what will stand the test of time, ask your designer. If you are adding in colour with paint on the walls, keep in mind that paint is easy enough to switch out if you get bored of it. Even more adaptable are your selections for artwork and fun kitchen accessories! If this isn't your 'forever home,' you may have chosen to stay classic with some of the more permanent choices, but now is the time to have fun with vases, paintings, chalkboards in frames, and more! So start clipping, pinning, bookmarking and 'liking'. Set up an appointment with a design-build company who has a wide depth of experience with gourmet kitchen renovations in Winnipeg and you'll soon be enjoying gourmet dishes in your gourmet kitchen! 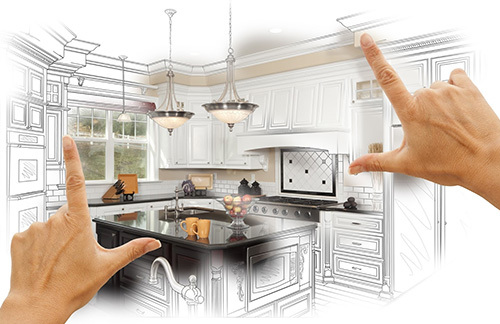 Harwood Design Builders is your choice for Winnipeg kitchen renovations. Harwood has received a number of awards for kitchen renovations from the Manitoba Home Builders Association and from the Canadian Home Builders Association.